If they haven't been clocking in and you need to add in a Timesheet for them as it's the end of the pay period, you can create a Timesheet for them. If their name isn't in the list, it's either because they already have a shift or Leave request for this day or they're not active in Tanda. Double check they don't have any times or leave entered for this day otherwise go to Workforce > Staff and check their name in the list. Click on their profile to ensure under Permissions they're ticked as an Employee. In the main Staff page you can also check under Tools > Former Staff or click Add Staff to add them to Tanda. 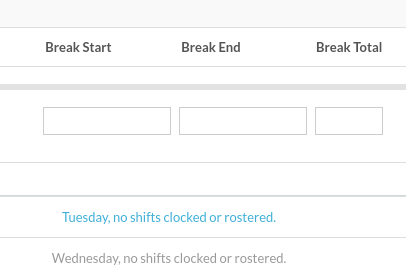 When you click Add Shift a shift row will be created for this employee where you can select their Team, enter their start and finish times, their Break times, and Approve the shift. If you can't see the employee's name in the list, check the reasons above under Daily including whether the employee is Active with Employee permission, in Former Staff or needs to be added. This is done by clicking on "Tuesday, no shifts clocked or rostered", to bring up a shift line. Once you have entered the relevant times, click Approve All at the bottom to approve the Timesheet ready for export.